I hadn’t thought that 60 minutes and three pieces of paper could change my life forever. Well actually, they didn’t. While it felt that way at the time, the real agent of change was a who: Dr. Lane, the theology professor who had just presented a simple, practical workshop on prayer my freshman year at Concordia. Undoubtedly, the source of any new understanding was our Heavenly Father’s Word, but the way the Word was given—frankly, gently, gladly—made a stirring difference. Dr. Lane led us to see that even though prayer presents us with paradoxes, we can trust in the Lord, ground our prayers in His words to us, and relentlessly hold Him to His promises because of Christ. Dr. Lane isn’t the only theology professor at Concordia who is brimming with readily accessible wisdom. In fact, I’m more than confident in saying Concordia’s theology faculty will make your years at Concordia worth everything else. From one student to another, here are six reasons why. 1. They love your questions. These professors are personable and approachable, both in and out of class. One morning, I had an obscure question about a Hebrew word in one of the Psalms. I asked Dr. Jastram about it over after-chapel coffee. He was more than happy to listen, then emailed me a long, thorough answer within about an hour! Now that doesn’t always happen at a university. Assistant Professor of Theology Rev. Dr. Jonathan Mumme chats with student Anna Hahn outside of class. The accessibility of CUW's theology professors is one of the things that makes them so uncommon. 2. They push and stretch you. Don’t mistake friendliness for laxity! 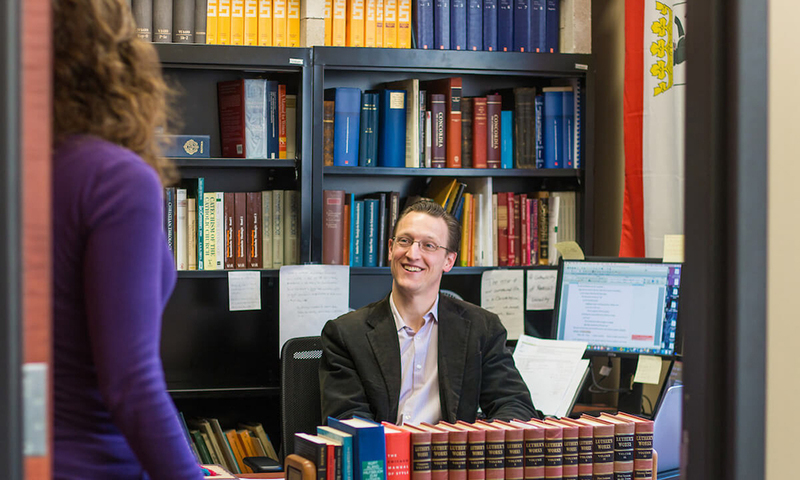 Concordia’s theology professors challenge students to become thorough readers, sharp writers, and intense thinkers about hard questions. You can’t become a heretic in sixteen weeks, Dr. Mumme tells his Lutheran Confessions class. Ask questions, press issues! There’s no fear of ridicule—you will be treated respectfully and seriously. 4. They are true scholars. These professors are pretty much downright brilliant. Their expertise covers a terrifically wide range: from expertise on Reformation theologians, to mastery of biblical (and other!) languages, to years of experience in the parish and mission field. Given their through-the-roof qualifications, it’s pretty amazing that they’ve chosen to commit their careers to a bunch of teenagers and 20 year olds. 5. They are gifted teachers. The respect these scholars deserve ought not lead to intimidation! If anyone can bring difficult truths down to the undergraduate student’s level, these teachers can. Dr. Paavola is famous world-wide (or at least campus-wide) for his ability to engage and get through to his students. Professors have helped me wrestle with plenty of challenging teachings –election, suffering, free will, and Law and Gospel, to name just a few. 6. They are pastors. And I think that’s the life-changing, truly uncommon factor. Take it from a student who’s been there: if you’re standing in the hallway, wondering whether you should bother your professor with your personal doubts, worries, or struggles—stop wondering. Knock and be invited in. 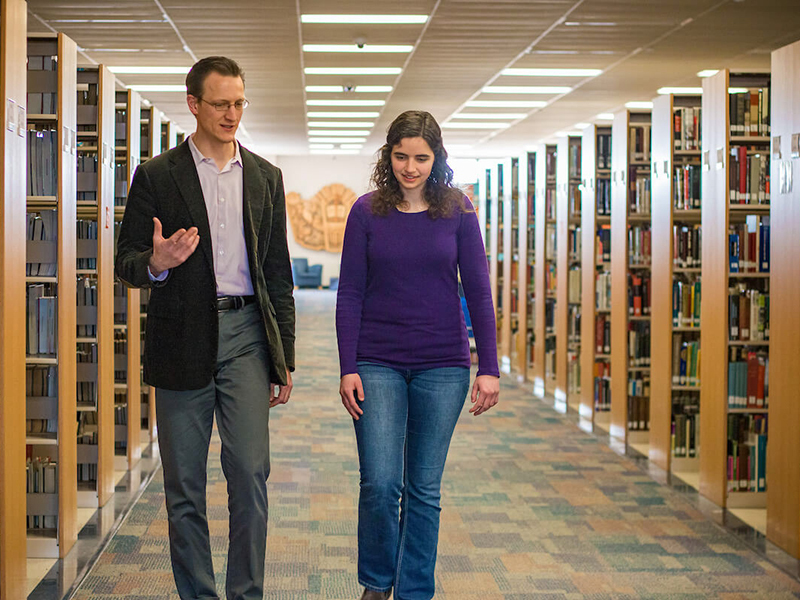 As shepherds of God’s people, Concordia’s theology professors want to hear you, help you, and speak the Lord’s truth to you. They are compassionate and wise. They’ve seen it all—stress, sleeplessness, tears, shame, even sin. These pastor-professors will help you come to know just how real all this theology is: that God, in his mercy, enters real time and space and brings your life into His. That all His grace and forgiveness and wisdom are a pure gift, guaranteed because of Christ. With that kind of knowledge, from that kind of professor—I don’t think students could consider their education common. In fact, I think they couldn’t help but be changed forever. —This article is courtesy of Anna Hahn (’18). Anna is majoring in classical education and, following her May graduation from Concordia, plans to either pursue a master’s degree in theology or teach in a classical Lutheran school.